She drives a Volvo, he rides a Harley; she’s a book worm, he’s a sports fan; He’s into Heavy metal, she’s more precious metals. 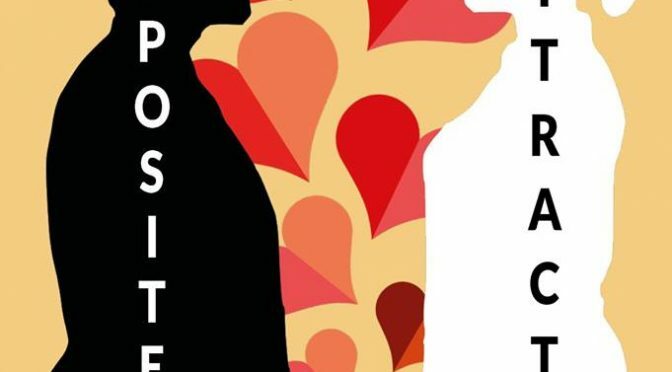 Do opposites really attract? 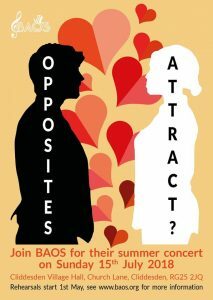 Join Basingstoke Amateur Operatic Society (BAOS) as they entertain with musical numbers from well-known shows – past and present – in their 2018 concert, Opposites Attract?. Popular show tunes include modern hits from ‘Rent’, ‘Les Miserables’ and ‘Hairspray’. There are also classics from musicals such as ‘Annie Get your Gun’ and ‘Princess Ida’. Something for everyone! Come and picnic with us at Cliddesden Millennium Village Hall from 12pm before a toe-tapping concert 1.30pm-3.30pm! Please bring a picnic to enjoy; chairs will be provided, but you are of course welcome to have your own with you. Drinks and cake will be available at the venue for a donation. Ticket prices: Adults £10, 5-16 years £7 (plus booking fee). Under 5 years go free. Tickets on the door: Adults £12, 5-16 years £7. Under 5 years go free. Please email comms@baos.org with any questions. Further details will be announced throughout April.